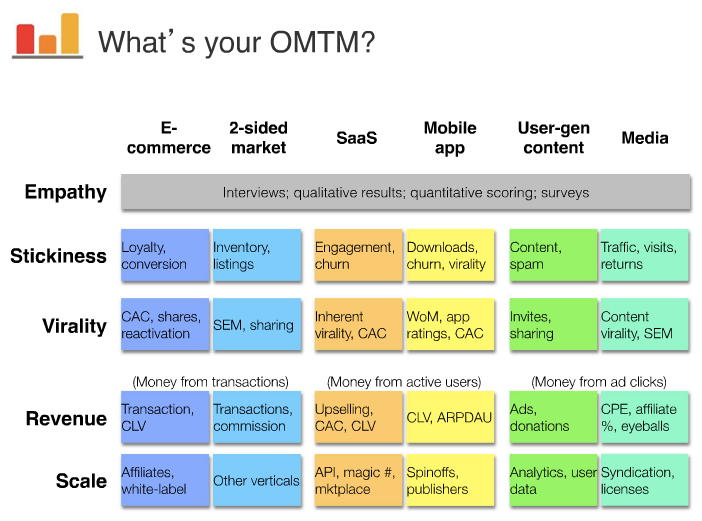 What is OMTM and 5 innovation metrics and how to test them? That doesn’t mean there’s only one metric you care about from the day you wake up with an idea to the day you sell your company. It does, however, mean that at any given time, there’s one metric you should care about above all else. Communicating this focus to your employees, investors, and even the media will really help you concentrate your efforts. There are three criteria you can use to help choose your OMTM: the business you’re in; the stage of your startup’s growth; and your audience. 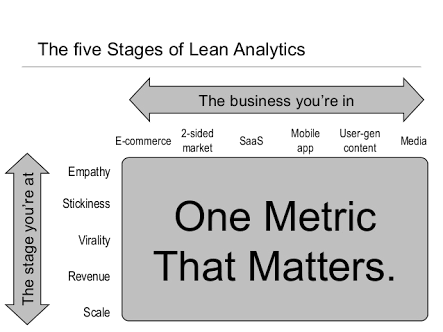 There are also some rules for what makes a good metric in general. First: what business are you in? We’ve found there are a few, big business model Key Performance Indicators (KPIs) that companies track, and they’re dictated largely by the main goal of the company. For online businesses, most of them are transactional, collaborative, SaaS-based, media, game, or app-centric. I’ll explain. Someone buys something in return for something. Transactional sites are about shopping cart conversion, cart size, and abandonment. This is the typical transaction funnel that anyone who’s used web analytics is familiar with. To be useful today, however, it should be a long funnel that includes sources, email metrics, and social media impact. Companies like Kissmetrics andMixpanel are championing this plenty these days. Someone votes, comments, or creates content for you. Collaboration is about the amount of good content versus bad, and the percent of users that are lurkers versus creators. This is an engagement funnel, and we think it should look something like Charlene Li’s engagement pyramid. Collaboration varies wildly by site. Consider two companies at opposite ends of the spectrum. Reddit probably has a very high percentage of users who log in: it’s required to upvote posts, and the login process doesn’t demand an email confirmation look, so anonymous accounts are permitted. On the other hand, an adult site likely has a low rate of sign-ins; the content is extremely personal, and nobody wants to share their email details with a site they may not trust. On Reddit, there are several tiers of engagement: lurking, voting, commenting, submitting links, and creating subreddits. Each of these represents a degree of collaboration by a user, and each segment represents a different lifetime customer value. The key for the site is to move as many people into the more lucrative tiers as possible. Someone uses your system, and their productivity means they don’t churn or cancel their subscription. SaaS is about time-to-complete-a-task, SLA, and recency of use; and maybe uptime and SLA refunds. Companies like Totango (which predicts churn and upsell for SaaS), as well as uptime transparency sites like Salesforce’s trust.salesforce.com, are examples of this. There are good studies that show a strong correlation between site performance and conversion rates, so startups ignore this stuff at their peril. Someone clicks on a banner, pay-per-click ad, or affiliate link. Players pay for additional content, time savings, extra lives, in-game currencies, and so on. Game startups care about Average Revenue Per User Per Month and Lifetime Average Revenue Per User (ARPUs). Companies like Flurry do a lot of work in this space, and many application developers roll their own code to suit the way their games are used. Game developers walk a fine line between compelling content, and in-game purchases that bring in money. They need to solicit payments without spoiling gameplay, keeping users coming back while still extracting a pound of flesh each month. Users buy and install your software on their device. App is about number of users, percentage that have loaded the most recent version, uninstalls, sideloading-versus-appstore, ratings and reviews. Ben and I saw a lot of this with High Score House and Localmind while they were in Year One Labs. While similar to SaaS, there are enough differences that it deserves its own category. App marketing is also fraught with grey-market promotional tools. A large number of downloads makes an application more prominent in the App Store. Because of this, some companies run campaigns to artificially inflate download numbers using mercenaries. This gets the application some visibility, which in turn gives them legitimate users. No company belongs in just one bucket. A game developer cares about the “app” KPI when getting users, and the “game” or “SaaS” KPI when keeping them; Amazon cares about “transactional” KPIs when converting buyers, but also “collaboration” KPIs when collecting reviews. Infrastructure KPIs (cost of running the site; uptime; etc.) This is important because it has a big impact on conversion rates. Second: what stage are you at? A second way to split up the OMTM is to consider the stage that your startup is at. Spoiler alert: for us, at least, Twitter beats pretty much everything else. Am I satisfying that need? There’s MVP validation—have we identified a product or service that satisfies a need. Here, metrics like amplification (how much does someone tell their friends about it?) 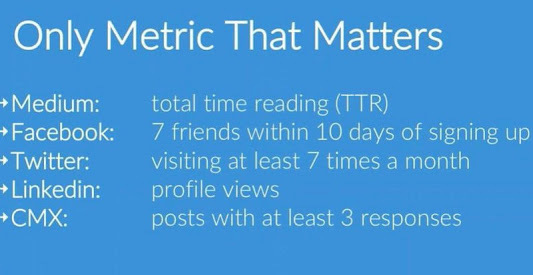 and Net Promoter Score (would you tell your friends) and Sean Ellis’ One Question That Matters (from Survey.io—”How would you feel if you could no longer use this product or service?“) are useful. Am I building the right things? Then there’s Feature optimization. As we figure out what to build, we need to look at things like how much a new feature is being used, and whether the addition of the feature to a particular cohort or segment changes something like signup rates, time on site, etc. This is an experimentation metric—obviously, the business KPI is still the most important one—but the OMTM is the result of the test you’re running. Is my business model right? There’s business model optimization. When we change an aspect of the service (charging by month rather than by transaction, for example) what does that do to our essential KPIs? This is about whether you can grow, or hire, or whether you’re getting the organic growth you expected. Later, many of these KPIs become accounting inputs—stuff like sales, margins, and so on. 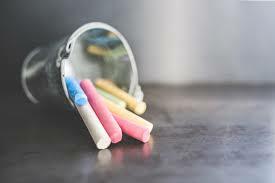 Lean tends not to touch on these things, but they’re important for bigger, more established organizations who have found their product/market fit, and for intrapreneurs trying to convince more risk-averse stakeholders within their organization. Third: who is your audience? A third way to think about your OMTM is to consider the person you’re measuring it for. You want to tailor your message to your audience. Some things you share internally won’t help you in a board meeting; some metrics the media will talk about are just vanity content that won’t help you grow the business or find product/market fit. Let’s say you’ve thought about your business model, the stage you’re at, and your audience. You’re still not done: you need to make sure it’s a good metric. Here are some rules of thumb for what makes a number that will produce the changes you’re looking for. A rate or a ratio rather than an absolute or cumulative value. New users per day is better than total users. No more complicated than a golf handicap. Otherwise people won’t remember and discuss it. For “accounting” metrics you use to report the business to the board, investors, and the media, something which, when entered into your spreadsheet, makes your predictions more accurate. For “experimental” metrics you use to optimize the product, pricing, or market, choose something which, based on the answer, will significantly change your behaviour. Better yet, agree on what that change will be before you collect the data. Perhaps you’ve optimized the number of enrolments in your gym—but now you need to focus on cost per customer so you turn a profit. Maybe you’ve increased traffic to your site—but now you need to maximize conversion. ​Innovators are in the business of making unsafe bets – safe bets generally aren’t innovation at all. Apple made a big, unsafe bet with the iPhone, and bets such as that often don’t pay off. To successfully explore disruptive innovation, most companies will want to create an environment that supports lots of small, unsafe bets. We want to allocate relatively insignificant amounts of capital to a portfolio of ideas, look at how customers react and then make educated decisions on what to keep funding. Innovation metrics are part of this task. Do people care enough about an idea to act – for instance, by clicking through from an ad to a website? How to test: Run ads on platforms like Google and Facebook targeting your customer problem. Count your clicks per 1000 impressions. When people find out a little about what you offer, will they take a proactive step such as leaving an email address? How to test: Create landing pages with copy, imagery and a compelling “call to action” button to sell the solution. Count your button clicks per 100 visitors. Are people willing to pay for your product or service? How to test: Display a price point with a “Buy Now” button. Count the clicks on “Buy Now” per 100 visitors. Will people come back for more? How to test: You can use Google Analytics to track the percentage of new versus returning visitors, monitor email engagement with Mailchimp or track individual user engagement with Kissmetrics. Do people refer you to their friends and family? How to test: Referral programs such as InviteBox and ReferralCandy help you track the number of invited and converted users. Success depends on factors such as cost structure, lifetime value of a customer, risk profile and a healthy dose of “gut”. Expect to fail – but fail small and learn valuable lessons along the way. Tesla founder Elon Musk correctly points out that “if you’re not failing, you’re not innovating”. Today’s climate favours small cross-functional teams with a relentless focus on defining and solving a customer problem. It particularly favours teams that experiment and measure and constantly adapt their products and business models to deliver what wows customers. Previous Post Micro campaign and ad revenue.